Heat oven to 350°F. Spray 12 mini muffin cups with cooking spray. Unroll 1 can (8 oz) Pillsbury™ refrigerated 90-calorie crescents dinner rolls or crescent dough sheet onto cutting board. If using crescent rolls, firmly pinch and press perforations to seal completely. 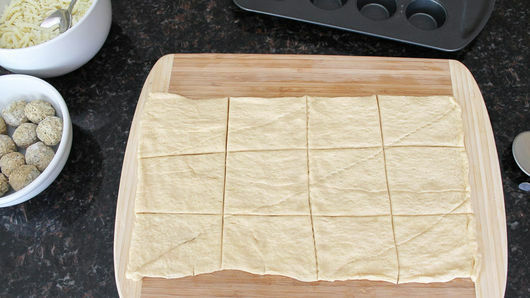 Cut dough into 12 equal squares. In medium bowl, stir together 1 1/2 cups shredded mozzarella cheese (6 oz), 1/2 teaspoon dried Italian seasoning and 1/2 teaspoon garlic powder. Place 1 dough square in each mini muffin cup; press in gently to make crescent cups. Using about two-thirds of cheese mixture, divide cheese mixture among crescent cups, leaving room for meatballs. Gently press 1 frozen cooked Italian-style meatball into each cup. Set remaining cheese mixture aside. Bake 10 minutes. 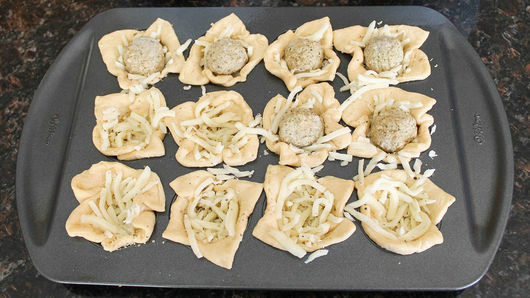 Remove from oven; top meatball crescent cups with remaining cheese mixture. Bake 5 to 7 minutes longer. Remove crescent cups from muffin cups to cooling rack; cool completely. To freeze, transfer cooled crescent cups to labeled gallon-size resealable freezer plastic bag. Freeze. To reheat, heat oven to 350°F. Remove desired number of frozen crescent cups from bag; place in mini muffin cups on cookie sheet. Loosely tent with sheet of foil that has been sprayed with cooking spray; bake covered 15 to 17 minutes. 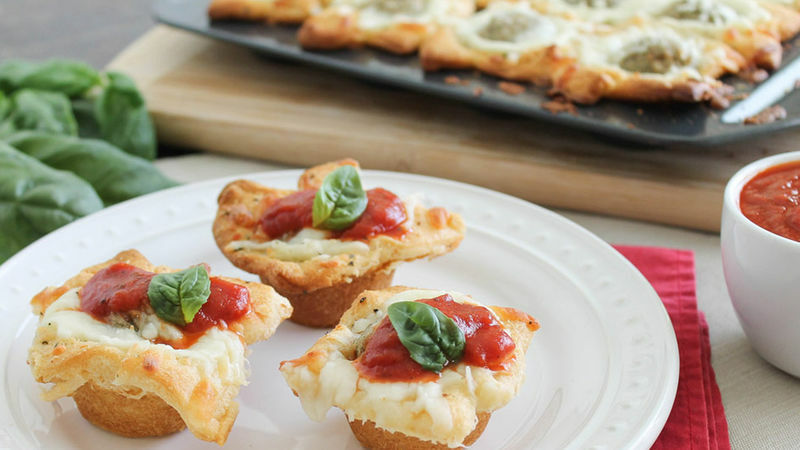 Serve with warm marinara sauce and garnish with basil, if desired.